The Muppets - Fine Art Parody. Jan mobil van, van Eyck’s Arnolfini Wedding Portrait reenacted oleh Kermit and Miss Piggy. 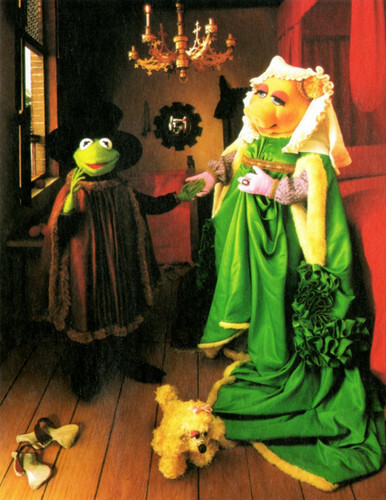 Wallpaper and background images in the The Muppets club tagged: muppets miss piggy kermit frog green parody arnolfini wedding fine art. This The Muppets fan art contains buket, korsase, seikat bunga, buket korsase, and nosegay. There might also be kirtle, rok, polonaise, polineis, pengiring pengantin, pengiring kehormatan, and pendamping.